I finally listened to Part II of This American Life’s two-part series on desegregation in America, and I highly recommend taking some time to listen to the series if you care about school assignment policy and diverse schools. Part I is about the benefits of integrated schools, and has some truly awful-to-hear excerpts from public comment at a Missouri school board meeting after a white-majority district learns that students from a black-majority school in a neighboring district will be coming to their community. Part II is fascinating. It’s about Hartford, Connecticut, a majority high-poverty black/latino district, and how after a long court case, the district is trying a voluntary desegregation program. There are several important ways that the Hartford situation differs from San Francisco, and some important parallels. In many ways we are already trying a voluntary desegregation program here in San Francisco and failing badly. Maybe the attractions of the new Willie Brown MS will help us turn that corner — building a program that clearly will attract white and asian families. Maybe. But if these programs make one thing clear, it’s that desegregation policy is not easy. Listen to the programs (free if you stream them from the web site) and let me know what you think. The letters went in the mail Friday afternoon, and the results of the first part of the 2015-16 assignment process are out. If your child wasn’t a younger sibling and wanted one seat at Clarendon, you had to compete with 96 others for that one seat — there were only 16 seats open to non-siblings this year. You had to compete with 64 other people for each of the 16 non-sibling seats open at Peabody. And you had to compete with 48 others to snag each of those 26 non-sibling seats at West Portal. Predictability is important to folks (though based on years of watching this process I would say it’s less important than feeling you have access to a school you want), but predictability cuts both ways. It’s actually quite predictable that most children whose parents want them to go to Clarendon or Peabody will not actually get in. My advice, year in year out? If your tolerance for uncertainty is low, then work to figure out how your attendance area school can work for your child. If it actually can’t work for you, then realize that the competition for any of the 20 schools that received the most requests the year before is probably going to be brutal — as in double digit requests for every non-sibling seat. Another good discussion in the Student Assignment committee tonight. We continue to analyze data around the “Supporting Equity in Student Assignment” resolution proposed by Commissioner Fewer and I last summer; we are also more broadly talking about ongoing re-segregation in San Francisco public schools (recently analyzed in a terrific package in SF Public Press), the continuing mismatch between population and choice requests in the Bayview, and specific access issues at Clarendon — it’s an outlier but one that is a very real problem for residents of that attendance area. Before I recap some of the specific topics/ideas discussed, I want to be very clear that the only proposal on the table is the narrow “CTIP Flip” proposal from Commissioner Fewer and I. The Board will likely vote on this proposal in late May or early June, but in response to concerns from the public that we were rushing the proposal through last summer, I agreed to fully dissect the proposal in committee over this school year. So that’s what we are doing. In the bullet points below I will recap a number of additional ideas and thoughts Board members threw out tonight for the staff to consider and analyze, but I want to be very clear that any of these ideas found to have merit will receive extensive public vetting and analysis before coming to a vote. They’re ideas, that’s all – not fully-baked policy proposals. Responding to questions and requests from the Committee’s December meeting, staff brought back a bit more analysis to explain why Clarendon is so impacted and to gauge the Board’s interest in exploring particular solutions. There are essentially three issues that are conspiring together to create a “perfect storm” for residents of the Clarendon attendance area. First, in 2013-14 there were 120 children who resided in the Clarendon attendance area eligible to apply for Kindergarten. A large number of those children applied for other schools — maybe because they had older siblings at those schools, or wanted language programs or had some other reason for not applying to their attendance area school. But of the 34 attendance area residents requesting Clarendon as their first choice for K, only six were offered a seat in Round I; this low “acceptance” rate is due to Clarendon’s popularity across the City and a high number of younger siblings claiming the majority of K seats each year. The next problem is that the closest schools to the Clarendon attendance area are Rooftop and Alice Fong Yu. Both of those schools are highly requested, citywide K-8 schools, making them low probability choices for Clarendon residents looking for an alternative close to home. Finally, Clarendon has a total of 88 Kindergarten seats, but 44 of those seats are citywide, because they are earmarked for the Japanese Bilingual Bicultural Program (JBBP). This means only 44 K seats are available for the attendance area tiebreaker. So: solutions. We threw around a few ideas tonight (stress: ideas. Re-read the paragraph above “Clarendon” before hyperventilating). We could shrink Clarendon’s attendance area (remembering that changing one attendance area creates a ripple effect through all the contiguous attendance areas, and all the attendance areas contiguous to those attendance areas, and so on ). We could move the JBBP to some other site, thereby opening up 44 additional general ed seats at Clarendon. We could also make Clarendon a citywide school and redistribute its attendance area among the contiguous attendance ares. Not much interest in any of those ideas except the possibility of moving JBBP, though that idea would need much more analysis. Should all K-8s be citywide? Thinking more broadly, we actually have a large number of citywide seats for elementary school — 59 percent of sears are attendance area, and 41 percent are citywide. Is that too many? What if we made the non-language pathway K-8s attendance area schools? We asked the staff to analyze that question. Originally, (and I actually think it was my suggestion), we thought K-8s were such popular options that it made sense for any K-8 seat to be a citywide seat, whether or not it was a language pathway seat. But at that time, we were receiving a lot of flak for the middle school feeder plan (definitely the most controversial part of the assignment system changes in 2010). No one thought the feeders would take hold as strongly as they have, and so the “virtual K-8” idea is much more of a reality than it appeared to be five years ago when we were constructing the current assignment policy. The committee agreed it is worth taking a look at what would happen, both to attendance areas (again, remember the ripple effect described above when you change ANY attendance area) and to overall predictability if we made non-language pathway K-8 seats attendance area seats instead of citywide seats. In looking at the data on current choice patterns, not to mention the analysis in recent Chronicle and Public Press articles, it’s clear that the CTIP preference isn’t diversifying schools in any comprehensive way, and might be allowing families who are eligible for the CTIP preference to self-segregate. From Commissioner Wynns’ perspective, the preference represents a promise to assist low-income students of color in accessing higher-performing schools where they will add diversity. She asked Commissioner Fewer and I tonight why we don’t agree. Commissioner Fewer answered by reiterating her belief that choice — the ability to research and evaluate schools and to take time off work and secure childcare to be able to visit schools — is inherently inequitable, favoring families who can do those things. I added that it seems more and more clear that by prioritizing parent choices, our system is creating schools of last resort, and we know that children suffer in these schools. I am willing to retain some layer of parent choice in our system, and even add some priority for disadvantaged families, but I think we should encourage families to attend their local schools unless there is a compelling reason not to. We need families with resources and choices who live in the Bayview, for example, to stay in the Bayview and help us balance the schools there. Commissioner Walton, a resident of the Bayview, was at the meeting tonight. In a conversation after the meeting, he asked me what this resolution would do to attract families who are currently choosing schools outside of the Bayview. What I admitted to him, and he agreed, is that this resolution simply clears the ground — it makes it a little less attractive to leave neighborhoods with low performing schools (and stress little. It’s a very modest tweak). What’s still needed is for us to plant some seeds. I believe our work with Willie Brown MS will show the neighborhood that with will and commitment, we can build a great school out of the ashes of a failing one. Still, we need to find the right formula for George Washington Carver, for Bret Harte and for Malcolm X to attract those families with choices. The next meeting of the Student Assignment committee will be in April, where we are planning a panel discussion with desegregation experts and the Board. Stay tuned for more details. I am chairing the Ad-Hoc Committee on Student Assignment for the 2014-15 school year, and we had a meeting December 8 to discuss the pending resolution I authored with Commissioner Fewer that would change the strength of preferences offered to students applying for Kindergarten. Finally, I’ve got some time to recap that meeting! We had a wide-ranging discussion that touched on an earlier simulation of the effect of implementing the change on the assignments made for the 2014-15 school year, other methods of weighting CTIP (Census Tract Integration Preference) that would add an income qualifier, and other analysis that Commissioners would like to see. The staff presentation from the meeting is here. Most of the information in the presentation centers on the current effect of weighting CTIP 1 residency above attendance area, and what might happen (based on 2014-15 requests) if we re-weighted that preference to give attendance area more weight. 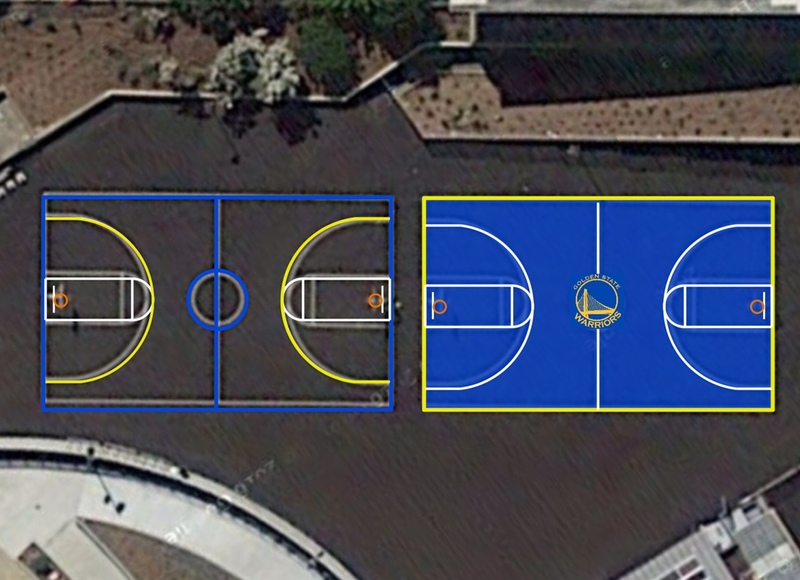 It’s important to emphasize that all other schools/pathways with an attendance area (meaning schools that are not citywide schools or do not have a citywide language immersion pathway) offered a seat to 100% of attendance area residents listing that school/pathway as a first choice in Round 1. Commissioner Wynns noted that this is remarkable — and she’s right, so it bears repeating one more time. 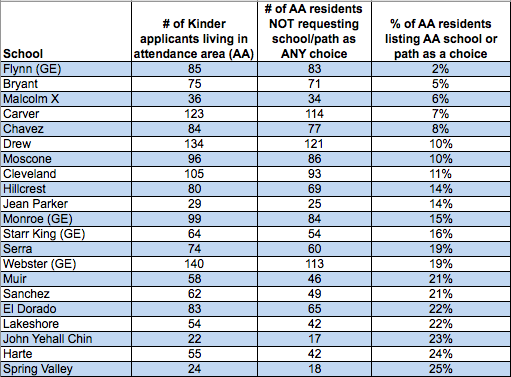 The vast majority of families who list their attendance area school as a first choice — siblings or non-siblings — are offered that school in Round 1. 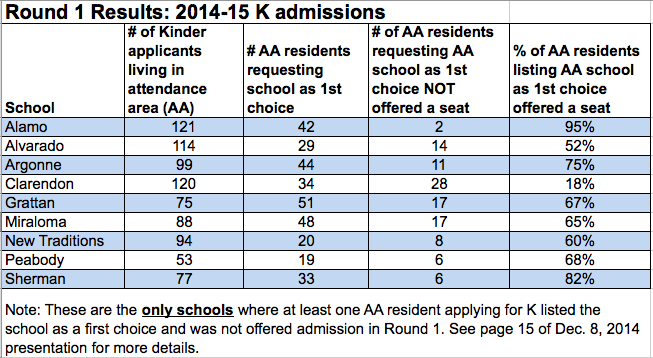 Put another way: 109 K applicants who listed their AA school or pathway as a first choice were not offered admission to that school or pathway in Round 1, but those 109 represent a scant two percent of all 4701 first choice requests in Round 1 last year. So: if you live in any other attendance area than the nine schools listed above, you are almost assured of receiving your attendance area school in the lottery if you list it as a first choice, even if you have no other tiebreakers. Clarendon only has 44 out of 88 seats that are subject to the attendance area preference. The other 44 are citywide seats due to a language pathway. Clarendon has a huge number of younger siblings applying for K seats. In 2014-15, 51 younger siblings of current Clarendon students applied for admission in all pathways. Up until 2011-12, Clarendon was an alternative school with significant busing. This means that families from all over San Francisco had access to and were encouraged, through busing and other means, to apply to Clarendon. There’s an issue here, and Commissioners remarked generally that our current system — prioritizing siblings and CTIP1 residents — adds to the very slim odds we see for anyone without those two tiebreakers being admitted to the school. Indeed, the district’s simulation of re-prioritizing attendance area would have resulted in nine more students from the Clarendon attendance area being offered seats in Round 1. (In total, 39 additional students from each of the nine attendance areas listed above would have been offered seats in their attendance area schools if the Fewer-Norton proposed adjustment to the assignment preferences had been in effect for 2014-15 enrollment). I should also note that re -prioritizing attendance area would result in three fewer African American students and two fewer Latino students being assigned to Clarendon. Overall race/ethnicity impacts of re-prioritizing attendance area at the nine schools the proposal affects are on page 17 of the staff presentation. However, these simulations are based on current applicant pools. And there is the problem: our applicant pools for almost every school are less diverse than they should be. Our problem, quite simply stated, is that our choice system is allowing families to self-segregate. Of these 22 schools, at least half are located entirely or partially within CTIP1 areas, and many of them are serving majority African American, Latino and Pacific Islander students. These groups of students are more likely to apply late (post Round 1), and so are more likely to be placed in schools where there is space — after all of the people who applied on time for Round 1 are placed. If we believe that a strong CTIP tiebreaker is most likely to benefit families who are in a position to research their choices and take advantage of options without worrying unduly about logistics like transportation and start times, then it makes no sense to actively encourage these families to leave the attendance areas for schools where their presence would add socioeconomic diversity, if not racial diversity. We need to be looking at mechanisms that make applicant pools for all schools more diverse — we already know that while choice does empower certain parents, it has failed to increase diversity. One thing that is striking in looking at the simulations is how modest and weak CTIP is as a tool to desegregate schools. We also need to prioritize the areas where we most need racial and socioeconomic diversity — the areas where racial isolation is definitely depressing academic achievement for all children. Those areas, in my opinion, roughly correlate to the CTIP areas. In the end, it’s good to offer parents choices, but not at the expense of children whose parents can’t or won’t take advantage of the choice system, and not at the expense of overall faith in the system. So: how do we fix it? The CTIP “flip” we’ve proposed will have a modest effect on nine schools — allowing more attendance area residents to access some of our most popular and most middle class schools. There will be a slight — very slight — decrease in diversity at those nine schools. The bigger question is what will happen at the 22 schools shown above where residents are choosing out in large numbers. The district’s simulation of the effect on these schools isn’t particularly helpful, in my opinion, because so few people are choosing these schools in the first place, and so many people who live in these attendance areas are choosing different schools in other parts of the City. Would a system that still allows you to choose other options but prioritized admission to your attendance area school make a difference on enrollment at some of our most challenged schools? Maybe. In my opinion, it’s worth a try. The committee did discuss adding an income qualifier to the CTIP preference, but there’s no great way to do this for Kindergarten. Eligibility for free/reduced price lunch is problematic because eligibility for these programs is determined much later in the cycle — starting about four weeks before school starts. We could ask parents to sign a form, under threat of perjury, that they are eligible for Free/Reduced Price Lunch, but we’d have to be willing to enforce it in order to have any confidence in the results. Anyway, doing this is still a possibility, but we need to discuss it more, which we will do at the next meeting on February 5. The other options available to us are more expensive: program placement and busing. I am not interested, at this point, in entertaining a large-scale return to busing — even if we could afford it. Buses are expensive and in my opinion not the most high-impact strategy for raising achievement of all students. Program placement is very much an option, but you have to be willing to invest a lot of new dollars in under-enrolled schools, and be thoughtful about whether the programs you’re putting in a school will be for the benefit of all children at the school — and not just serve as displacement mechanisms. This is what we are trying to do at Willie Brown MS, which will open in August 2015. We’ve invested millions in a new facility, and are designing state of the art academic programs. Coupled with the high school “golden ticket” mechanism, we hope these investments will be enough to attract a diverse, robust enrollment of students at a school site that has, in recent history anyway, failed to attract many families at all. If it works, we’ll have a roadmap for how to do this in other places. If it doesn’t . . . The next meeting of the Ad Hoc Committee on Student Assignment will be Thursday, Feb. 5 at 6 pm in the Board Room at 555 Franklin Street.